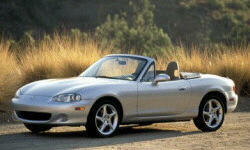 Mazda MX-5 Miata Pros and Cons | Page 1 of 2 | Why Not This Car? What drives people to buy (or not buy) a certain car? TrueDelta's members share Mazda MX-5 Miata pros and cons based on their real-world driving experiences. The most fun car to drive. Better than a Mini. Not as expensive as a porsha. What else could you want. I am now retired and have owned several brands of sports vehicles. I knew that the MX-5 would have the lowest maintenance costs. Miatas have good reliability, and the Miata is the kind of car that makes everyone smile, and other MX5 owners wave. Really. Gorgeous car. Simple, uncluttered lines. This is a clear descendant of the first Miata and British roadsters of years gone by. Powerful engine for car weight. 5 speed manual transmission. Regularly exceeds mpg estimates. Get 28-34 mpg. I average about 8.5 L/100 km, so even though it uses Premium fue, it only costs about $40 to drive as much as 475km. This is with gas at about $1.20 a litre. Great fun for a second car. Quick, responsive, go kart-like handling. Super fun in corners and curves. Great connection between car and driver. I always felt a tremendous amount of control, even when going a bit too fast through corners. Best handling car available for under $75k; one of top 5 best sports cars at any price. Famously responsive - and it really is. Cool design. Always wantd a British roadster. Found a Japanese one! Handles like much more expensive roadsters. The car just dances. Seems to turn on a pivot. Steering responds impeccably and intuitively to driver input. no surprises. Incredibly similar to Boxster in handling dynamics for half the price or less (though it does feel less weighty & powerful). VERY fun on winding roads. The car is so light that it responds very quickly. It is eager to play. Overall it is fun no matter what speed you are running at. The car corners well, feels like part of your body. It is precise, easy, amazing! This car can handle with the best of them and can take on any curves you can throw at it. Very pleasing to the eye, very sporty look.